Remember when we told you that DC Comics' second-most-used character name was Starman? Well here we go again. From birth, Thom Kallor had the ability to affect the weight of objects by pulling gravitational forces from the stars. 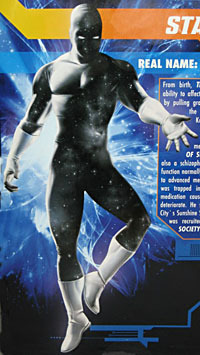 As Starman, Kallor went on many adventures throughout time and space as a member of the Legion of Superheroes. He is also a schizophrenic who is able to function normally in his own time due to advanced medicine; but, when he was trapped in the past, lack of medication caused his condition to deteriorate. He sought help at Opal City's Sunshine Sanitarium, where he was recruited by the Justice Society of America. This is officially Starman VIII - but he was originally Star Boy I, and that was the name he adventured with the LoSH under. He first appeared as Starman in Kingdom Come, with no explanation of why he was in the present instead of the future. Well, the "present" of Kingdom Come, which is actually the future, but not as much of the future as it would have to be for him to actually belong there, you get it? He was about 90 years too early. Many of the characters in Kingdom Come were taken from designs Alex Ross did when he was a kid, and Starman was one of those. Of course, Ross recognized that his design was basically just a ripoff of the '70s Starboy costume, he decided to just go ahead and make it the same person. Hey, no judgment: every young artist has been a thief at some point, and we all look back on those times with regret. 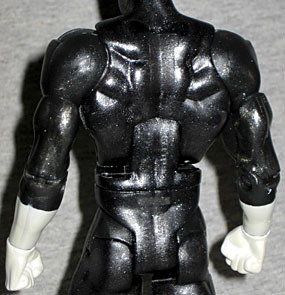 Mattel actually went about creating StarboyMan's costume in a very interesting way: the majority of the figure is molded from translucent black plastic, which gives the figure a feeling of depth, as though you weren't looking at a solid surface, but rather staring into a deep void; secondly, instead of attempting to paint lots of individual stars all over his body, the plastic has glitter mixed right in, meaning he sparkles in the light. Considering that his costume is supposed to be a map of the multiverse, shifting stars are a much better option than a limited number of painted ones. We do wish there a few larger stars scattered around so he didn't look like he who shall not be named, but it's a tradeoff. Seeing them as stars rather than stripper glitter requires a little mental investment. His boots and gloves are pearly, rather than plain white. Thom uses the small male body, and shares Atom's head. That's fine though, because he also includes a second replacement head. It's unmasked, showing him with his full, thick beard, and just proves two things: 1) wow, this design is really straight out of the '70s, and 2) it's kind of ridiculous that they were still calling him "StarBOY" when he looked like this. He looks like the freaking Brawny Man. Or King Randor, if MotU Classics weren't done in the wrong scale. The articulation is the same as all the other DCU Classics, but that doesn't mean there are no surprises. Remember how we spent years complaining that, despite having balljointed heads, the figures could never look up for a decent flying pose? Well for some reason, Starman's neck actually moves forward and back a little, providing just enough of a boost to the range to allow him to approximate an upward glance. 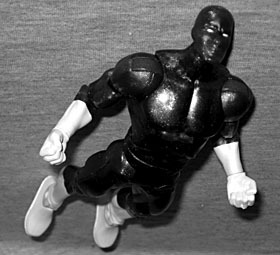 What's different about this figure than the dozens of other uses of this mold? The art by Mike Thompson on the back of the box is less dynamic than previous offerings - Flash was getting ready to run and Atrocitus was lunging at us and spewing blood, but Starman is just hovering and holding ons hand out (and the foreshortening on the fingers of his left hand seems off, somehow). But while the pose may be simple, the costume details aren't. He's lit from behind, and where the light hits him his costume just looks like black cloth, but in the shadows the stars come out to play. Very cool. With this figure, you get your choice of what collection you want to put him in. Were you one of the dozen or so lucky bastards who managed to get the Legion of Superheroes set during the nine-second span when it was actually in stock on Mattel's site? Put the Burt Reynolds beard head on him and he's right at home. Collecting the JSA? He was a member for a while before the reboot hit. Heck, if you bought a bunch of the Kingdom Come toys DC Direct put out, he can go there, too. 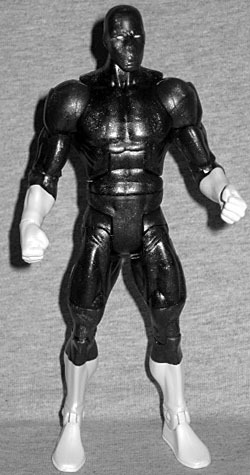 This is one of the last figures that was announced before the deadline for joining the Club Infinite Earths subscription, and while he didn't seem like he'd be very impressive, Starman turned out well.